Peaches go beyond just pies. 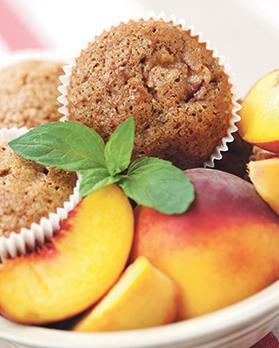 These delicious peach recipes, courtesy of the California Cling Peach Board, are bursting with sweet flavour. Line the bottom of a spring form pan with a circle of waxed paper. Using an electric mixer, cream the butter and superfine sugar together for four or five minutes, until pale and airy. Add in the Frangelico almond liqueur, Grand Marnier or reserved peach syrup and almond extract. Continue to beat for a few more minutes until the sugar has nearly dissolved. Blend in the almonds. Reserve. Whip the cream with the sugar and vanilla until it just holds very soft peaks. Gently fold the lightly whipped cream completely into the almond mixture. Cover the bottom of the spring form pan with 1/3 of the almond cream. Arrange half of the peach slices in a sunburst pattern on top of the almond cream. Cover with another 1/3 of the almond cream. Repeat with another layer of peach slices and cover with the remaining almond cream. Firmly tap the filled pan onto work surface in order to settle the mixture and remove any air pockets that may have formed. Cover with some plastic wrap and refrigerate for at least five hours or overnight. The Peach Charlotte may be prepared a day in advance to this point. Remove the plastic wrap and run a sharp knife around the edge of the pan. Unlatch the spring form pan, leaving the ring in place. Place the selected serving plate upside down over the mold and reverse the finished charlotte onto the plate. Remove the ring and bottom of the pan. Remove the waxed paper. 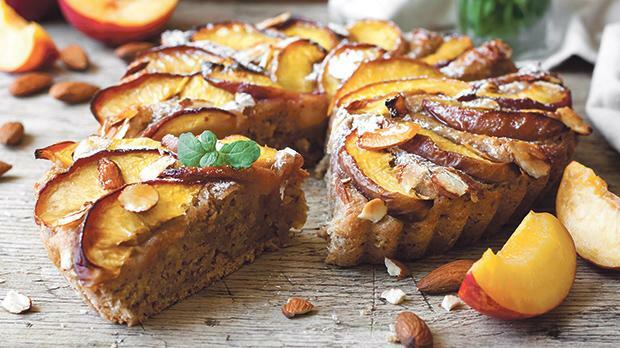 Garnish with the reserved peach slices and use the reserved ground almonds to sprinkle on top. Refrigerate until service. For best results, slice with a damp knife. In a separate bowl, blend sugar with butter until smooth and light. Whisk in egg, buttermilk, vanilla and lime peel. Pour over dry ingredients. Add peaches and coconut; stir gently until the dry ingredients are moistened. Spoon batter into lightly oiled or paper-lined muffin cups, filling three-quarters full. Bake on centre rack in preheated oven for 30 to 35 minutes or until tops are firm to the touch. Gently lift from pan and cool on a rack. Tip: For a glossy look, brush each muffin, while still warm, with a little honey. Storage: For freshness, keep the muffins in an airtight container.